By the beginning of the 21st century, however, it was clear this growth model was no longer working. Open space was dwindling, encroached on by new subdivisions. Residents had to drive longer distances for employment or services, choking major highways and local roads in traffic. The scarcity of affordable rental housing made it difficult for young adults to find their own homes on the island. Segregated communities and school districts prevented the growing Hispanic and black populations from accessing good schools, housing, and jobs. Property taxes soared as economic growth slowed. In 2012, Superstorm Sandy caused widespread destruction on Long Island and brought home the reality of the threat posed by climate change. With over 1,000 miles of coastline, the island is particularly vulnerable. By 2050, more than 90,000 Long Island homes could be vulnerable to flooding from more frequent and intense storms, up from around 60,000 today. Long Island has already begun a transformation in response to these challenges. 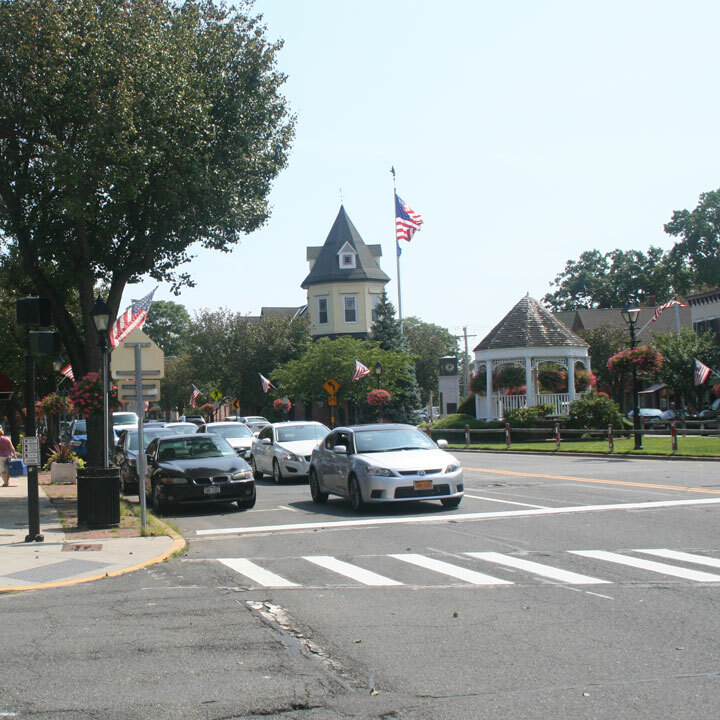 Villages including Patchogue and Westbury have revitalized their downtown areas and shown that walkable communities with affordable multifamily housing can improve suburban living. Amityville, Glen Cove, and other places are undergoing similar change. Many coastal communities such as Long Beach and Mastic Beach have begun integrating resilience measures into local planning. Still, the pace of change is slow. Zoning codes, for example, still prohibit or greatly restrict multifamily housing in too many downtowns and around too many train stations. Towns and villages need more help to prepare for climate change, and have barely begun coordinating even though the most effective solutions often require cross-municipal collaboration. Few attempts are being made to use new technologies to address traffic congestion and parking. Transportation projects already underway will strengthen Long Island’s economy by promoting more growth around train stations. Long Island Rail Road’s East Side Access project will allow riders to travel directly to Grand Central Terminal, saving as much as 40 minutes a day and boosting property values near stations. A third track on LIRR’s Main Line will improve reliability and service into job centers like Mineola and Hicksville. And a second track from Farmingdale to Ronkonkoma will improve service between Long Island’s largest concentration of jobs along Route 110, and Suffolk County’s busiest rail station and airport. Together, these projects should lead to the creation of many more jobs, homes, stores, and services around LIRR stations. While these transportation projects are sorely needed, they won’t solve all of Long Island’s transportation problems. North-south transit links will still be scarce, and traveling the “last mile” from the train station to home or work will still be challenging without a car. And as service improves and ridership grows, additional train capacity will be needed through Queens and into Penn Station. The Fourth Regional Plan’s recommendations build on Long Island’s recent successes and enable it to become the model for a sustainable and equitable 21st century suburb. Connecting and expanding the region’s three commuter rails into one regional rail system would increase the frequency of trains, and allow riders to travel directly to destinations throughout the region. Integrating affordable, on-demand services into last-mile transportation strategies, along with improved bus service and better north-south rail links, would expand travel options and reduce the need for parking. Diverting car trips to transit, strategically upgrading components of the highway network, and using tolling based on time of day and traffic levels would reduce congestion on the island’s overcrowded highways and also reduce air pollution. Shifting more of the responsibility for education funding from local school districts to the state and encouraging school district consolidation would relieve local property tax burdens and improve educational outcomes in low-performing schools. Allowing multifamily housing such as townhouses and garden apartments near every train station, and requiring all new housing projects to include low and moderate-income homes would make housing more affordable for people of different incomes. A new Regional Coastal Commission, backed by a state adaptation trust fund, would help Long Island towns and villages coordinate and implement strategies to deal with the impacts of climate change across municipal boundaries. In the longer term, some communities will need to be supported in their efforts to transition away from the areas at very high risk of sea-level rise and storm surge—with more effective buyout programs, for example, and assistance to socially vulnerable residents. Connecting more Long Island neighborhoods to coastal areas and parks with a network of accessible walking and biking trails would improve recreation options, make residents healthier, and support the island’s tourist economy.